Historical – Red Wolves originally occupied eastern North America, from the Gulf Coast into southern Ontario, Canada. Current – Extinct in the wild in 1980, Red Wolves are now in a captive breeding-and-release program. The primary wild release area is eastern North Carolina, on the peninsula between the Albermarle and Pamilico Sounds. Low human density, wetland soil type and distance from roads seem to be the most important habitat features. Wild – Rabbits, squirrels, fawns, birds and eggs, plus insects and reptiles as available. Zoo – Canine Maintenance, with frozen feline; fasted weekly; bone or muscle meat weekly. Red Wolves are cinnamon or tawny, with black-tipped guard hairs. The ears are usually red and the tail-tip black. The summer coat is more reddish than the dense winter coat. In all seasons, the “eyebrows” are cream, plus cream, usually, along the lips. Red Wolves seldom form large packs. Mother and pups hunt together, the father hunting with his mate when the pups are young. Unlike Gray Wolves, they are much less likely to pursue adult deer. Red Wolves seldom howl. When they do, it is often more reminiscent of coyote chortling. The young, especially, do a lot of singing and chortling. Red Wolves are nocturnal, but this may be due more to human pressure than to historic life history. Red Wolves have long thin legs, typical of cursorial [running] hunters, and they, consequently, appear “square” – as tall as they are long, chest to rear. Hearing and vision are keen, necessary for being nocturnal predators, and the sense of smell is excellent. There is a definite change in coat, summer being short and coarse, almost slick-coated, and winter being double and soft. This is termed acclimation (or acclimatization), an adaptation to changing seasons. Acclimation of any sort IS an adaptation. Something cannot become adapted, it either is or it is not adapted – at birth. Red Wolves mate for life. Gestation, as in all of genus Canis, is about 62 days. Usually 4 altricial pups are born, the eyes opening after about 2 weeks. Pups begin to take partially digested food at about 3 weeks, regurgitated by both parents. They begin joining the hunt at about 5 months, just after their deciduous canines drop out and the permanent ones begin to come in. They disperse before the next litter is born and are mature in 2 to 3 years. Longevity is less than 10 years in wild, considerably longer in captivity. Lifespan 6-7 years in the wild and up to 15 years in captivity. Length 4.5-5.5 feet long (including the tail). Height About 26 inches at the shoulders. 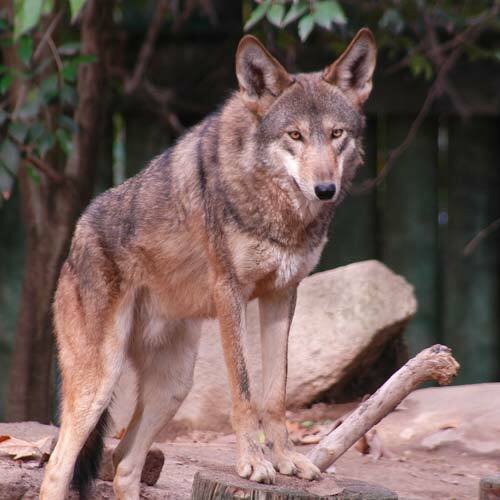 Endangered, because of persecution, land-clearing and hybridization with the Coyote, Red Wolves were declared extinct in the wild, in 1980, when the Fish and Wildlife Service took as many animals as they could find into captivity under the Endangered Species Act. Gray Wolves generally kill Coyotes and Red Wolves certainly prefer a Red Wolf mate, but, with the Gray Wolves extirpated, Red Wolf numbers greatly reduced and Coyotes multiplying, fewer mating possibilities led to hybridization. Each captured animal was DNA tested, because of hybridization. The results nearly stymied the recovery program. Only 14 animals, at that time, were found to meet the criteria for SSP species requirements, and a recovery project was begun privately. A captive-breeding program was started at the Point Defiance Zoo, in Tacoma, Washington. There were, as of 1997, around 300 Red Wolves in various locations, captive and wild. The number is growing, with wolves being released in several locations, including off-shore islands that are not large enough to sustain a pack, but adequate to act as a wild breeding center. Surveys continue to show local public support for Red Wolf release. They are now IUCN listed Critically Endangered. The Red Wolves at the Fresno Chaffee Zoo are part of the species recovery program and a number of pups have already been sent to the release sites. Unlike other youngsters born in a zoo, young animals destined for release are treated rather unceremoniously. If they must be handled, they are handled as if they were wild-caught and apt to bite. This rough handling is, of course, in their best interest. They must fear humans and not want to be around them at all. Red Wolves live in packs of 5 to 8 individuals and consist of an adult breeding pair and their young of different ages.